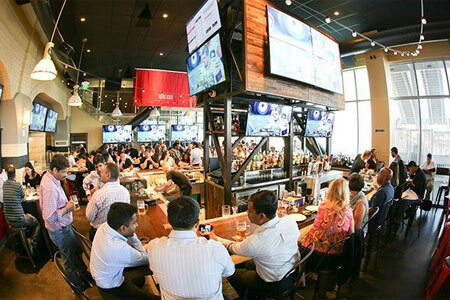 : Michael Mina's property at Levi's Stadium is comprised of three venues: Bourbon Pub, Bourbon Steak and Tailgate, a bar open to stadium members only. Bourbon Pub is casual, boisterous and filled with energy and football stadium-appropriate fare. The central bar and video screens galore reinforce the sports bar ethos, but the food and décor move beyond it. A menu of fun takes on tradition, such as truffle tater tots, delivers a playful experience. Burgers are available, of course, along with tacos, salads and fish and chips. Buttermilk drop donuts are the go-to dessert. For libations, round up a "beer wheel," a selection of eight two-ounce pours of interesting drafts. If the abundant house cocktails and wine offerings don't fulfill, ask for the list from adjacent Bourbon Steak.